Glyphosate is an herbicide. It is applied to the leaves of plants to kill both broadleaf plants and grasses. 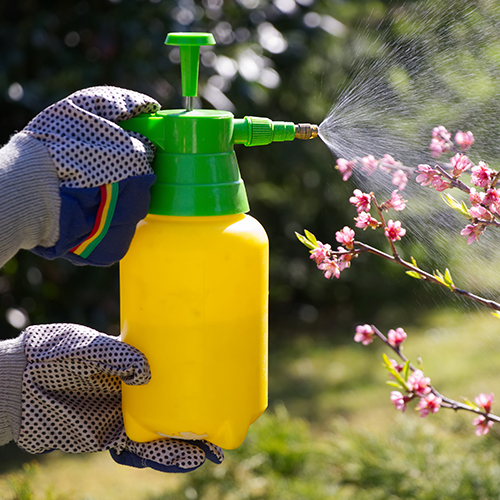 The sodium salt form of glyphosate is used to regulate plant growth and ripen fruit. Glyphosate was first registered for use in the U.S. in 1974. Glyphosate is one of the most widely used herbicides in the United States. People apply it in agriculture and forestry, on lawns and gardens, and for weeds in industrial areas. Some products containing glyphosate control aquatic plants. Glyphosate comes in many forms, including an acid and several salts. These can be either solids or an amber-colored liquid. There are over 750 products containing glyphosate for sale in the United States. Glyphosate is a non-selective herbicide, meaning it will kill most plants. It prevents the plants from making certain proteins that are needed for plant growth. Glyphosate stops a specific enzyme pathway, the shikimic acid pathway. The shikimic acid pathway is necessary for plants and some microorganisms. How might I be exposed to glyphosate? You can be exposed to glyphosate if you get it on your skin, in your eyes or breathe it in when you are using it. You might swallow some glyphosate if you eat or smoke after applying it without washing your hands first. You may also be exposed if you touch plants that are still wet with spray. Glyphosate isn't likely to vaporize after it is sprayed. Pure glyphosate is low in toxicity, but products usually contain other ingredients that help the glyphosate get into the plants. The other ingredients in the product can make the product more toxic. Products containing glyphosate may cause eye or skin irritation. People who breathed in spray mist from products containing glyphosate felt irritation in their nose and throat. Swallowing products with glyphosate can cause increased saliva, burns in the mouth and throat, nausea, vomiting, and diarrhea. Fatalities have been reported in cases of intentional ingestion. Pets may be at risk if they touch or eat plants that are still wet with spray from products containing glyphosate. Animals exposed to products with glyphosate may drool, vomit, have diarrhea, lose their appetite, or seem sleepy.